Umbria is the only region of the Italian peninsula with no coastline. The geographical heart of Italy, Umbria is closed in by Tuscany to the west, Emilia Romagna to the north, the Marches to the east, and Lazio (Latium) to the south. Umbria is divided into two provinces (Perugia and Terni). Its popoulation amounts to roughly 800,000 people that live in 92 comuni spread over an area of 8,500 sq. km (3,280 sq. miles). The city of Perugia is the capital of the province named after it, as well as the capital city of the entire region. Situated on a hill, Perugia has a population of just 150,000 and is connected to the rest of the country by a well developed network of roads. The two major arterial roads are the SS3bis (also called E45), which runs along the Tiber valley, and the SS75bis, called "Raccordo Perugia-Bettolle". The A1 The Rome - Florence motorway (the "Autostrada del Sole"), skirts the western borders of Umbria and is connected to Perugia by the "Raccordo Perugia-Bettolle". The A14 motorway down the Adriatic coast of Italy has an exit at Cesena for the E45 "superstrada" to Città di Castello and Perugia. 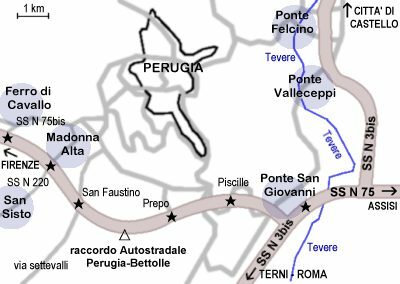 The SS75bis has five exits for Perugia (from North): Perugia-Ferro di Cavallo, Perugia-Madonna Alta (best to reach the "Renato Curi" football stadium) , Perugia-San Faustino (best to reach the main railway FS station, also good for the old town center), Perugia-Prepo (good to reach the old town center) and Perugia-Piscille (good to reach the old town center).